Dr. Charles Hubbert of Memphis, Tennessee, left, and wife Margaret Hubbert have given a lead gift to support an initiative to build band scholarships at the University of Mississippi. Director of University Bands David Willson, center, recently hosted the couple to hear one of the ensembles practice and then perform a concert. OXFORD, Miss. – When Dr. Charles Hubbert joined the band as a University of Mississippi student, a door swung open to exceptional cultural opportunities. 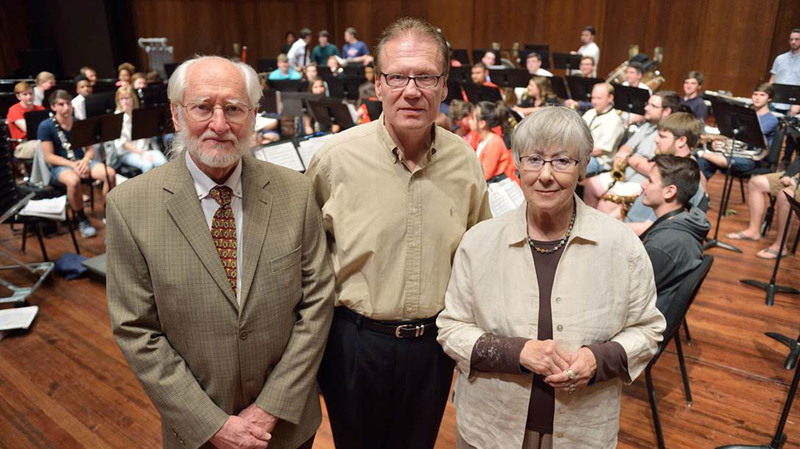 Some 57 years later, the physician continues to reap the rewards, inspiring him and his wife, Margaret, to make a lead gift to an initiative for band scholarships. The Mississippi native, who was born in Lambert and grew up in Grenada, had not traveled outside the state and when he enrolled at Ole Miss. Thanks to the Ole Miss Band program, the French horn player traveled to a music festival in Holland and the World’s Fair in Belgium. In fact, Hubbert recently made his 30th trip back to see the Dutch family that hosted him on that inaugural visit abroad. “Suddenly, as a student band member, I was being exposed to cultural experiences I had never had before,” said Hubbert, a neurologist and psychiatrist in Memphis, Tennessee, who also earned his medical degree at the UM Medical Center in Jackson. David Willson, the university’s director of bands and professor of music, said the Hubberts’ generous support will make an impact on students who give so much of themselves to the program. Ninety-five percent provide their own instruments, have spent years honing their skills and work many hours in all kinds of weather to perform on game day. Willson’s goal is to build a $2 million endowment to support band scholarships. “We are so thankful for Charles and Margaret Hubbert’s gift,” Willson said. “Their generous donation will benefit band students for years to come. As tuition goes up, we must find a way to stay competitive to attract band students in a very aggressive market. The Hubberts were so kind and humble when offering this gift and are a great example to us all in giving back. We are very grateful. The UM Band has been giving outstanding performances in concert and in support of Ole Miss athletics events since it organized in 1928. In addition to performing at all home football games and many away games, the Pride of the South Marching Band has performed at numerous bowl games. Several “pep bands” are formed out of the Pride of the South Marching Band and perform for numerous functions, such as pep rallies before home football games. Another extension of the band is the Ole Miss Basketball Band, which supports both Rebel and Lady Rebel basketball teams at home games, as well as during annual SEC and NCAA tournaments. The band program also serves as a teaching lab for those preparing to become band directors. In the spring when the marching band is not together, three performing concert bands and one lab band are available for future teachers. The Wind Ensemble tours each spring semester and holds a “Pride of the South” fundraising concert each April, Willson said. Ole Miss Band members represent a wide array of academic majors, including pre-med, criminal justice, engineering, business, political science and journalism. Each band member receives a scholarship. Band programs and glee clubs in small-town public schools were, and continue to be, essentially the only “free” music instruction available to many students, and those programs enable students to go on to participate in collegiate groups, Charles Hubbert said. Margaret Hubbert’s mother, a pianist and organist, studied classical music at The Julliard School in New York, inspiring her daughter to become a supporter of the arts. The Hubberts enjoy all types of music, attend musical and theatrical performances and art exhibits, and support the Shakespeare Festival in Memphis. “We’re very much lifelong students,” Margaret Hubbert said, adding that they have also participated in and organized medical mission trips to Africa, South America and the Philippines. Charles Hubbert even returned to college, this time to the University of Memphis, to earn a second undergraduate degree in music. Gifts of all sizes combine to provide band scholarships. Individuals and organizations can make gifts to the University Marching Band Scholarship Fund by sending a check with the fund noted in the memo line to the University of Mississippi Foundation, 406 University Ave., Oxford, MS 38655; or by going online at http://www.umfoundation.com/makeagift. For more information, contact Ron Wilson, development director, at jrwilso3@olemiss.edu or 662-915-1755.